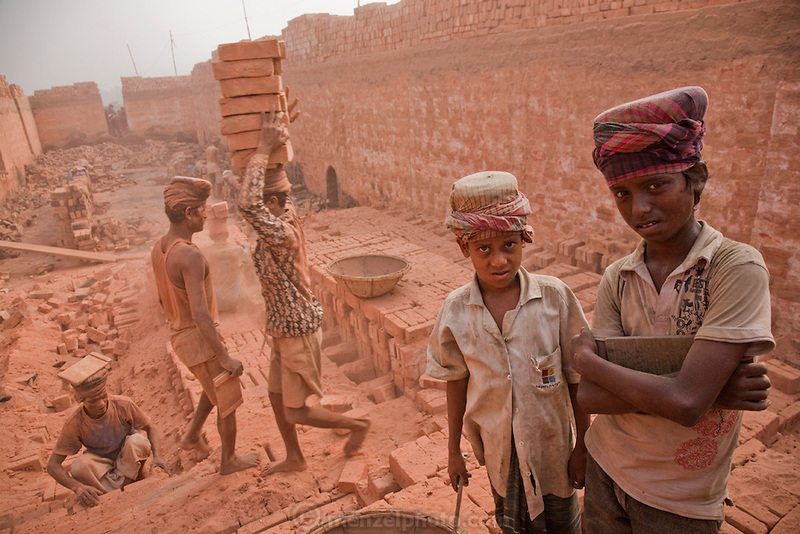 Child workers take a break at the JRB brick factory near Sonargaon, outside Dhaka, Bangladesh. Unlike the garment industry, where child labor restrictions are more closely monitored, rural agriculture and industry are less regulated and there is little if any oversight or enforcement. When queried, some laborers at a nearby site defended the use of child workers, saying poor families need their children to be breadwinners now if they are to have any kind of future. The heavy clay soils along the river near the market town of Sonargaon are well suited for making bricks. At the JRB brick factory, workers of all ages move raw bricks from long, stacked rows, where they first dry in the sun, to the smoky coal-fired kilns.